How do autocratic anomalies like the Gulf States weather the Arab Spring? Given that these states are the offspring of British imperialism it is remarkable that they are so stable. Some like Qatar are spearheading the Arab Spring through its broadcasting capability and funding the Syrian opposition. Others despite their huge carbon footprint are pioneering eco-friendly energy initiatives whilst exercising immense influence in the West. Their success cannot be reduced to money and hydrocarbon resources. Christopher M. Davidson’s latest book After the Sheikhs explores the mechanics of these countries and predicts that they will not survive the Arab Spring. Davidson, drawing on his academic expertise and his time in the Gulf, proposes that these states depend on oil subsidies and a rentier model which distributes wealth to its citizens to buy their acquiescence. This has allowed them to cultivate remarkable national unity in a region that was largely Bedouin and unimportant pre-oil Arabia. However, where Davidson goes out on a limb is the prediction that the life span of these states in their present form is less than two decades. 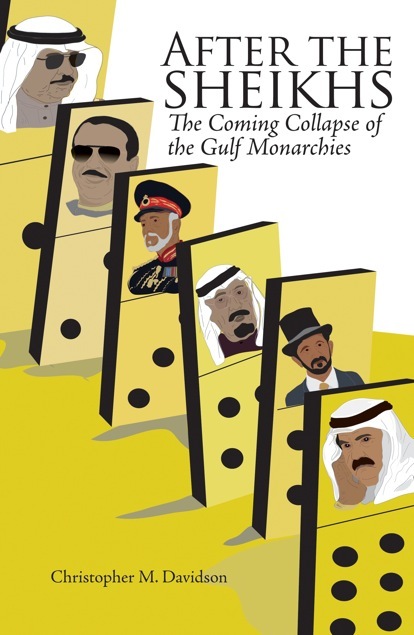 After the Sheikhs is detailed and erudite and reveals the Gulf States’ extraordinary survival strategies in their domestic and external spheres. It is extraordinary how these tiny states by investing in sports events, landmark buildings, universities like Oxford, Cambridge, Durham, LSE and of course armaments, shut down avenues of criticism. It is difficult to question the GCC’s woeful human rights record when they are creating British jobs. But then there are the cracks and follies. Whilst Islamists are coming to power under the banner of freedom and justice, authoritarian Gulf countries are cracking down on exactly that. They are employing foreign mercenaries who won’t hesitate to kill unruly citizens. Whilst Islamists are calling for more accountability Emirs are frittering away their money on sky scrapers and race horses. With almost Godlike audacity, they can create clouds to shade football fans at $500 000 a pop whilst its poorer citizens suffer power cuts and repression. Davidson suggests that the problem with these Gulf States is not just an economic one but an ethical one. Whilst a wave of Islamism is coursing through the region calling for temperance, Gulf States seem to have no qualms in investing in alcohol and gambling outfits (both are forbidden to Muslims). Whilst Egypt makes a symbolic gesture of defiance against Israel the Gulf prefers détente in the light of the Iranian ‘threat’. This moral bankruptcy, the un-sustainability of their wealth distribution model and the social media revolution sweeping through the Gulf suggest that nothing will avert the tide of change enveloping these princedoms. The end is nigh for GCC countries. Previous Previous post: The #COMETOGETHER exhibition, revolution and the Gulf Ripples of the Arab Spring felt in the Gulf States. Next Next post: Is it Because We’re Black?